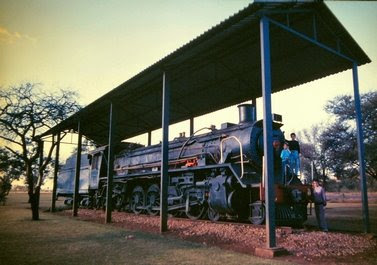 This particular locomotive was built by Borsig as works no 14658 in 1937. These versatile locomotives did extensive service on every system of the SAR. 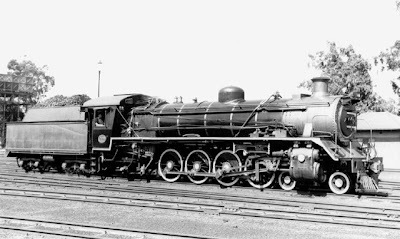 The very first batch of 19D's, delivered in 1937 & 1938, were 30 locomotives numbered 2506-2545, this plinthed locomotive was one of these. 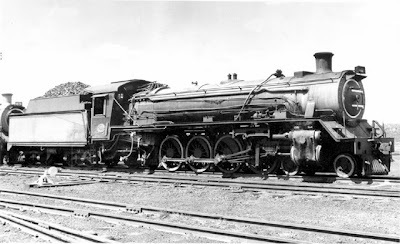 These locomotives came in two variations - some had a domeless boiler - and others a standard boiler. No 2541 above has a domeless boiler. These locomotives were identical to the class 19C, except that they were fitted with Walschaerts instead of the 19C's rotary cam valve gear. In all, 135 engines of this type were delivered before the war by Krupp, Borsig and Skoda. The 20 locomotives built by Krupp had domeless boilers for reasons known only to the builders. Over a period of time most of the other locomotives in the same class also lost their domes on the boiler! After the war a final order of 50 locomotives was delivered by in 1949 by North British Locomotive Co. 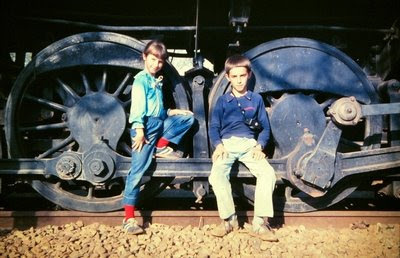 The driving wheels are 4 feet 6 inches in diameter. A drawing of the class 19D (series 4) can be found here.